These classic 14k gold hoop earrings are pictured at 3/4 inch in the main photo but are available in 1/2, 3/4, 1 or 1.25 inches and in solid 14k yellow gold, rose gold or nickel free palladium white gold . These are secure locking hoops forged from a continuous piece of either .8 mm or 1 mm thick wire, depending on the size, with the pierced end rounded and smoothed for comfort. This design gives you a secure hook and eye loop that snaps into place for security, no soldered posts or hooks to lose. Hoops are hammered for dimension and given a polished finish to create these elegant minimalist earrings. I am happy to taper the pierced ends to the thinner .8 mm on request on the heavier 1 mm 3/4 inch and larger hoops for sensitive ears. Just contact me in advance or leave a message in notes to seller at check out. The small 1/2 inch hoops will be made entirely from 20 gauge - .8 mm diameter wire to make the small diameter easier to open and close. These are substantial looking hoops but are still nice light weight earrings you can sleep in because you forget they are there and the tension locks the catch in place! Gold Colors: 14k yellow, rose or palladium white gold. Palladium white gold is nickel free and is not rhodium plated. If you are looking for larger hoops or hoops made with a more substantial 16g/1.3 mm thick wire wire, contact me for a quote and custom listing! 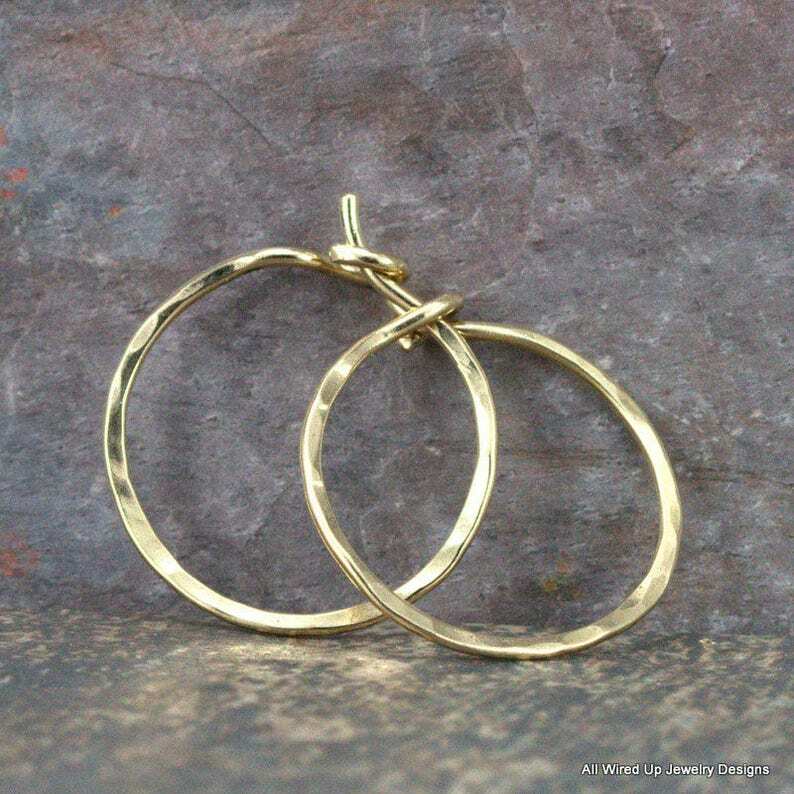 Classic Solid 14k Gold Hoops are an accessory you love to wear all day every day! Photo shows a full size mannequin wearing an earring to give you a sense of the 3/4 inch size! Your earrings will come packaged in a box suitable for gift giving. Each pair of hoops includes a storage bag and a square of Sunshine polishing cloth to keep the mirror finish looking bright! All my designs are created with 100% recycled materials. Well made and look great! Thank you!